A man tosses a banana peel in a recycling bin at Main Beach.Photos by Gabrielle Mix. Ice cream cones. Half-empty coffee cups. Greasy fast food wrappers. On a typical summer day, one can find an excess of sullied scraps in the recycle bins lining downtown Laguna’s beaches and sidewalks. 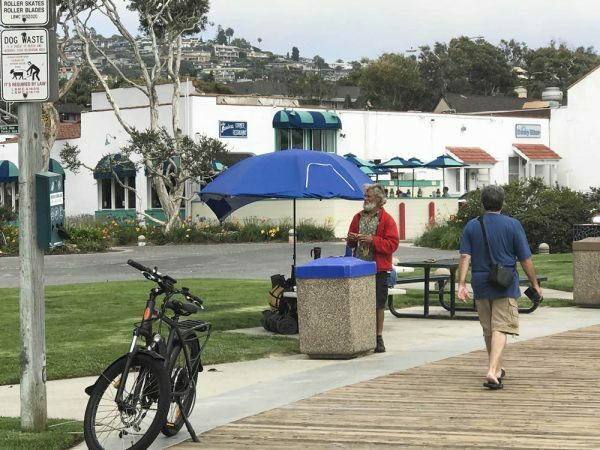 Laguna Beach city officials report that 70 percent of city waste is diverted away from landfills—a statistic that sets the small coastal town well above the state’s mandated 50 percent waste diversion rate. But to what extent do such recycling efforts yield more recycled material? Industry officials say city efforts may be hindered by members of the public who don’t practice good recycling habits. 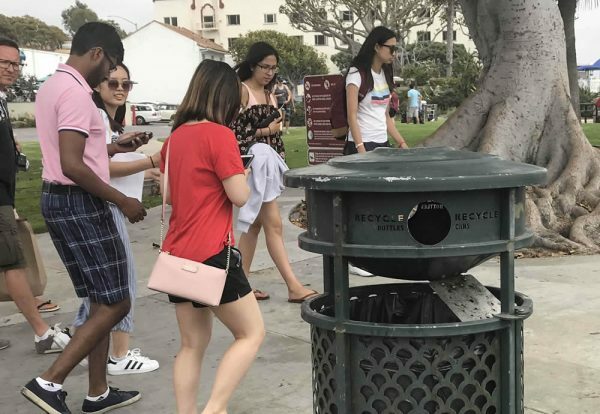 Lance Klug, public information officer for CalRecycle, said residents and visitors who throw anything and everything into Laguna’s blue bins slow down the city waste management department’s trash-sorting queue. “You kind of get into the habit of just throwing everything that you think, hope, wish, presume is recyclable into the recycling bin instead of checking with your local waste hauler and finding out if that material is recyclable,” he said. City officials said their first step to address recycling contamination issues is focusing on outreach and education. First, waste management drivers tag contaminated bins or carts and provide educational materials to residents. The city then calls residents who repeatedly recycle improperly and talk to them about the issue and encourage proper recycling habits. If that fails, residents can be charged a contamination fee. The costs associated with hiring more workers to sort out the non-recyclable items is not feasible for many haulers, Klug said, resulting in less trash being exported to China and more heading straight to the Prima Deshecha landfill in San Juan Capistrano. 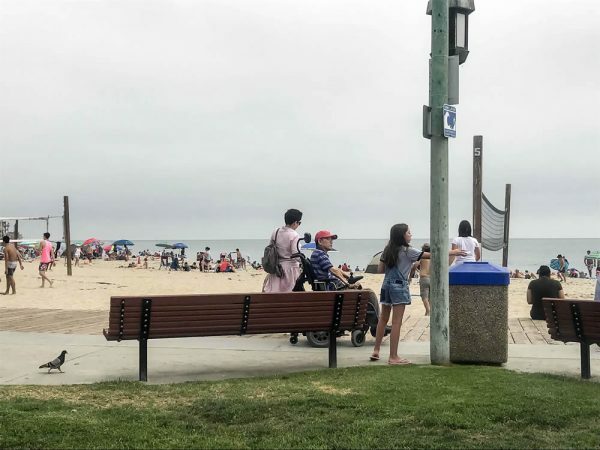 Laguna beachgoers stroll by a trash bin with the recycling divider left open. Compounding that issue is the dwindling market for recycled materials. Since the late 1980s, when the state adopted its Integrated Waste Management Act regulating solid waste management, many Californians have become more environmentally conscious. However, in January, the state’s main market for its recyclable commodity exports, China, closed its gates. America’s waste had been sent to China in massive cargo ships for years, but now this trash must meet a contamination threshold of no more than 0.5 percent. That means those peanut butter jars, take-out containers and juice boxes that have been thrown into recycling bins for years may no longer be accepted, unless they’re scrubbed clean. In addition, Murray said over the last five years, fossil fuel prices have dropped to the lowest levels in decades, subsantially depressing the scrap value of recycled materials. Because California is dealing with a narrowed market for its recyclable commodities, recycling contamination can even include goods like certain papers or plastic that seems recyclable. “We have failed to educate the public that not all plastics are recyclable…that paper with plastic coating or adhesives or food contamination generally can’t be recycled,” Murray said. A beachgoer tosses a contaminated hamburger wrapper into a blue recycling bin at Main Beach. Locally, Ryan Keller, a 17-year Laguna resident and Navy veteran, said many of the city’s recycling bins are mixed or not clearly labeled. “As a local dog walker in Laguna for 12 years…I see so many people who want to recycle but are confused by the trash cans,” Keller said. Keller believes improved signage on recycling bins and in windows of businesses that direct people to the nearest recycling locations would further improve Laguna’s waste diversion efforts. At a statewide level, Murray said Californians Against Waste is promoting legislation such as SB 168 by State Sen. Bob Wieckowski and SB 452 by State Sen. Steve Glazer that would increase markets for recycled materials and funding for recyclers. As a more preventative measure, Klug encourages the public to choose reusable containers over single-use items, such as switching from a plastic disposable water bottle to a thermos. He also wants to see companies reduce their usage of unnecessary packaging and make it clear to consumers whether a package is recyclable or not. “A lot of people don’t know that about a quarter of California’s disposable stream right now is packaging waste,” Klug said. California is currently working to create a new framework to manage packaging, but a lot of that falls on brand owners and consumers to nudge them in the right direction. City officials encourage residents to avoid bagging recyclables, to skip recycling items such as plastic wrap and plastic sandwich bags, and advises them to bring plastic grocery bags back to their local grocery store rather than adding them to the recycling bin. A complete list of recycling guidelines can be found at lagunabeachcity.net/recycling. Produce does not need packaging, let’s call-out Trader Joes on packaging waste. Why no mention of the brilliant liberal Jeff Bezos of Amazon filling our landfills with package waste? If you order a tiny shirt button they send it a cardboard box filled with more waste inside. It’s simple blue = trash (at home) and blue = recycle (away) simple fuzzy math easy for kids and adults to understand.